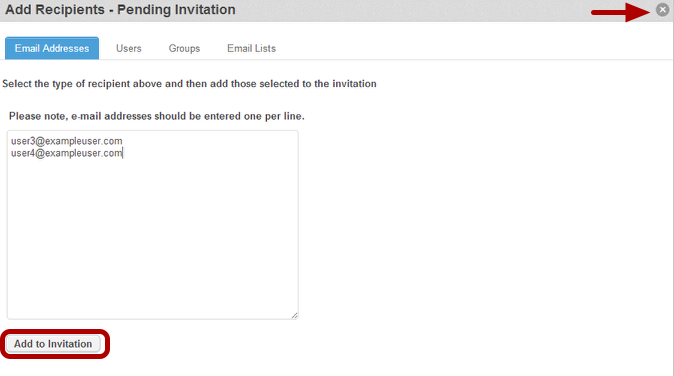 Checkbox allows you to add additional recipients to existing Checkbox Email Invitations. For example, let’s say yesterday you sent an survey invitation to an email list, but today realized that you forgot to include someone on the list. Checkbox allows you to add the new email address to the existing recipient list and resend the invitation to only that pending recipient. 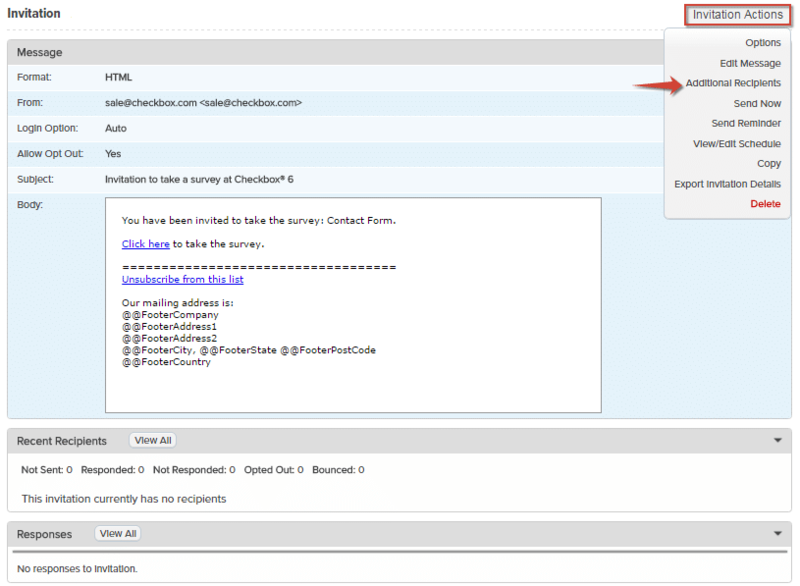 Select the survey you wish to add recipients to from the Survey Manager. 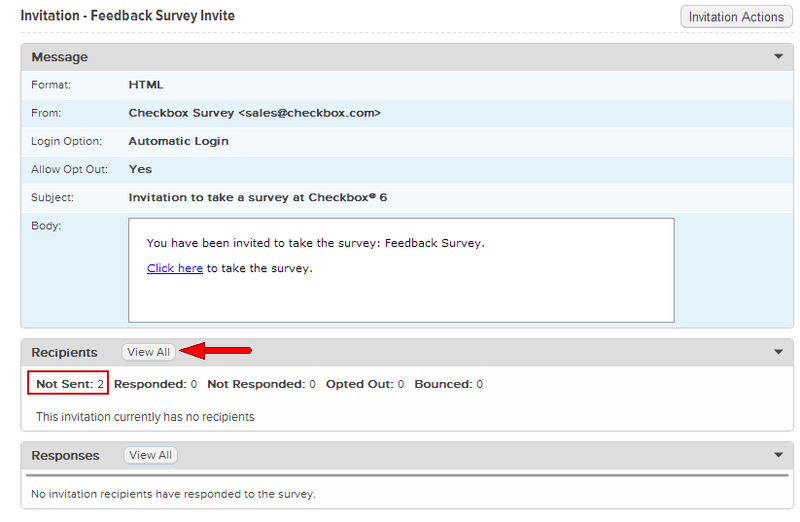 Once selected, that survey’s dashboard will appear on the right. At the top of the dashboard menu, open the Share pull-down and select Manage Invitations. Select the invitation you wish to add recipients to. If you have a long list of invitations you can use the Filter drop-down to sort invitations by “All”, “Drafts”, “Scheduled”, and “Sent”. Once the invitation is selected, a window will appear. You can view your existing recipient list by selecting the View All button under Recipients. Click the “x” to close the window and return to the invitation detail. To add new recipients to your invitation recipient list, expand the Invitation Actions pull-down and select Additional Recipients. In the above example we entered email addresses into the available text field under the Email Addresses tab. After selecting new recipients, click Add to Invitation to save. 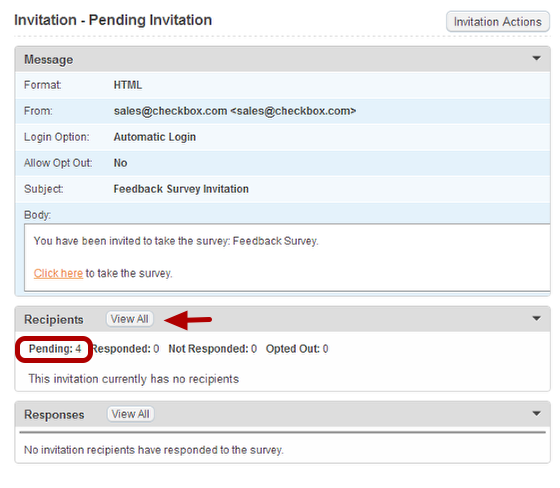 Close out of the “add recipients” window and look at your invitation detail. The number of pending recipients should have increased by the number of new recipients you just added. To view the recipients, select View All under Recipients. To remove a recipient, select desired recipient from the list and click the Remove Selected Recipient(s) button that appears.